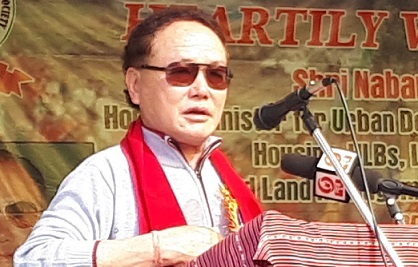 Chairman of the Joint High Power Committee (JHPC) on Permanent Resident Certificate (PRC) and senior cabinet minister of Arunachal Pradesh, Nabam Rebia has said the draft report of the JHPC on PRC would be ready by next two weeks. A report published on Thursday by Arunachal24.in stated that Nabam Rebia said after a final sitting before the budget session of the Arunachal Pradesh Legislative Assembly (APLA), the report would be ready and may be placed before the House. According to the report, Rebia said the 7th meeting of the JHPC was held at the State Banquet Hall on Wednesday in presence of many of its members. The meeting was attended by RWD minister Bamang Felix, Lok Sabha MP Ninong Ering, Peoples Party of Arunachal chairman Kameng Ringu, additional advocate general, deputy commissioner from Lohit, Namsai and Changlang and representatives of students’ unions. During the meeting it was decided that the committee now has to prepare the draft report which would be ready within next two weeks. JHPC chairman Rebia also said the draft report will be widely circulated to all the members concerned. After circulation of the report, a final meeting will be held likely before the budget session of the State Assembly so that the report can be placed before the House. It has been informed that the committee has visited various parts of Arunachal and discussed the sensitive issue of PRC with several organisations, leaders and administrations. During the course of its investigation, study and understanding, the committee has come across to views both in favour and against the granting of PRC. “Now the report will be submitted before the state government for a decision,” said Rebia. The minister said the committee has taken a strong exception to the so-called economic blockade observed in some parts of Assam adjoining Arunachal Pradesh regarding the issue of PRC. “We have repeatedly appealed to all the distinguished members to adopt a humanitarian approach to the old problem,” said the minister.